Susan Hutchison: Washington State’s Sarah Palin? Next week in King County, Washington, "nonpartisan" Susan Hutchison will be vying with Democrat Dow Constantine for the role of County Executive. The seat controls significant resources in a region that often plays a leadership role in future oriented public policy. If King County were a state, its budget size would be 13th in the country. Economically, the county lives on cutting edge science, engineering and technology: Microsoft, Boeing, Amgen, Nintendo and a host of tech/biotech startups. What national precedents is King County likely to be setting in the next go around? That depends in part on who sits in the executive seat. Constantine has track records in brokering anti-sprawl, sustainable development and historic preservation. He’s a proponent of strong, innovative carbon policies. But who is the elusive Hutchison? Seattle Times reporter Danny Westneat called Susan Hutchison a sort-of-Republican. Erica Barnett at the Stranger called her a Republican Religious Wingnut. A member of her own party called her "our Sarah Palin." Is Susan Hutchison a Palin in the making? You be the judge. 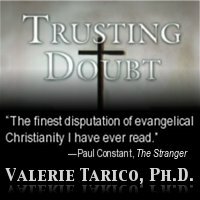 In this post, Bill Alford at Moral Politics Television, Seattle, interviewed Dr. Valerie Tarico, author, activist and former evangelical about what she perceives behind the nonpartisan veil. Is Susan Hutchison a stealth right-winger and closet fundamentalist, as some folks are saying? Let’s start with her political leanings. Hutchison is a solid triple R: Religious Right Republican. Since 2003, her political giving supported Mike Huckabee (over John McCain), George W. Bush and Dino Rossi. She spent $3000 trying to get Rossi into office. All of her political/religious affiliations are with what I would call effective, conservative or evangelical organizations with good PR. Calling herself "nonpartisan" is a smart posture, because King County majorities probably wouldn’t vote for Susan Hutchison if they were clear on her political identity. And it works. In an early interview with Seattlepi.com reporter Neil Modie, Hutchison herself said, "Our polls showed that 10 percent of the people responding thought I was extremely liberal." Her team is working to sustain that confusion. Well that depends on what you mean by fundamentalist? If you use fundamentalist to mean strident, cut-off-from- the-world and fringe, then no. Hutchison is gracious and charming and obviously right in the swirl of the Seattle’s fine arts community. If you mean a fundamentalist from a theological standpoint: the Bible is literally the perfect word of god, Jesus was born to a literal virgin, Jesus was a human sacrifice, people who don’t believe that are going to be tortured forever. Yes. It would appear from Susan Hutchison’s own words that she’s a born-again fundamentalist who thinks that politicians should use their status to promote their religious beliefs. Hutchison gave the keynote at a prayer breakfast this spring. Here is a reading she chose, which was followed by her own born again testimony and exhortation for politicians to use their bully pulpit to promote their (Christian) religion. Note the emphasis on blood sacrifice, belief and spreading the good news. This is a very evangelical choice, and she follows it with stories that reinforce the message. You can hear Hutchison’s message at WTV, linked above through Barnett’s article. Hutchison begins around 47 minutes into the breakfast. Well, what she was actually reading from is something called the Living Bible. It’s not a translation, so you won’t find it even at Evangelical sites like www.biblegateway.com that allow you to compare Bible translations side by side. Back in the 1970’s a fundamentalist preacher and writer named Kenneth Taylor decided he wanted the Bible to be more accessible, so he wrote his own version, an admitted "paraphrase." That means he put in his own words what he thought God was trying to say. I can’t resist quoting George Bernard Shaw here: No man ever believes that the Bible means what it says; he is always convinced that it says what he means. Actually, it’s not unusual for Biblical literalists to pick and choose what translations or paraphrases they use to make a point, as Hutchison has done. In The Purpose Driven Life, Rick Warren uses over 15 different translations, if I remember correctly. He chooses whichever translation best suits his point for different verses he cites. Hutchison chose not only her Bible but her text fragments carefully. She left out some parts that might have been a bit jarring. For example, early in her message she emphasized that Jesus made: "the earthly world with its rulers and authorities, its Washington State government . . . " The words "Washington State government" replaced the words, "all were made by Christ for his own use and glory". His own use? His own glory? It sounds kind of ugly. So she put in something benign that doesn’t jar listeners out of the narrative flow and in fact brings it closer to home. She is a wonderful evangelical speaker. Her message quality is on par with that of Joel Olsteen or Rick Warren. In a denomination that allowed women in the pulpit, she could draw a large congregation. But wouldn’t any real Christian be comfortable with those words she wrote? Wouldn’t they agree with them? Not necessarily. Many, many Christians would chose other words to represent their faith. Remember that for Susan Hutchison to read these words — there are layers of filtering here. As more is known about the Bible through linguistic analysis and archeological discoveries, more and more Christian theologians don’t think of the Bible as the literally perfect word of God. We know that some parts were copied from Akkadian and Sumerian texts, some parts were handed down through oral traditions. The Catholic councils that decided what got into the Bible and what didn’t — they didn’t have access to the same quality of information we have now, and they were responding to a specific political context. Hutchison’s reading is her edited selection of a paraphrase by Ken Taylor of The Book of Colossians. But who wrote Colossians? Scholars aren’t so sure any more. You can get a glimpse of the dispute even on Wikipedia. Hutchison chose this fragment of writing by a contested author paraphrased by a fundamentalist to fit her own beliefs about blood atonement and salvation — and her evangelistic message to electeds. This is a fundamentalist evangelical choice. People hear that Hutchison attends a Presbyterian church and they assume that she is mainstream in her community and beliefs. What they don’t know is that fundamentalism as a movement actually emerged out of the Presbyterian seminaries in the early Twentieth Century, and Presbyterian churches vary widely in terms of where they fall on the continuum. Hutchison’s church is not middle of the road for Presbyterians in this region. It is fairly middle of the road for evangelical churches. During the prayer breakfast message, Hutchison made another move that reflects both fundamentalist theology and her personality: She very graciously but clearly used evangelical language to dismiss other forms of Christianity. Well, part of the talk is a classic evangelical "testimony." This is a stock form of proselytizing in which the speaker shares their own born again experience. She talks about how she was raised in Christianity, knew the Bible but she wasn’t a real Christian until she realized she needed a "more personal faith" and had this "thing happen to her." The word personal — personal relationship with Jesus, personal salvation and so on — it’s a big word in Evangelical circles. She emphasizes salvation by belief in blood atonement. She repeats it several times. This is a way that Protestants, particularly Evangelicals differentiate themselves from Catholics, who believe that salvation comes through both faith and works. The message is that you are not really a Christian until you have this personal relationship, and salvation is about belief. What is the old saying? We are known by the company we keep. That is actually reasonable folk wisdom. James Wellman, University of Washington sociologist likes to say that, "Our sense of reality is socially constructed." It makes sense to assume that Hutchison’s priorities are shaped by her expressed values and her associations, just like the rest of us. So, independent of her work for the Simonyi Foundation, who does Hutchison hang out with? Her prayer breakfast talk was hosted by an organization called Washington Leadership. Their tag line is: A place where state and community leaders can come together with emerging leaders around the person of Jesus. I might expect Hutchison to be a bit fuzzy on church/state separation issues, because the evangelical mandate as I know it, and as she manifested it in her prayer breakfast talk, trumps separation. Hutchison appears to place a strong value on leveraging public exposure to spread her version of Christianity. Hutchison is on the board of Young Life international, which fits perfectly. It is a fun, smart evangelical organization that seeks to convert teenagers and get teenagers to convert each other to this fundamentalist theology we heard her reading. Until she began her run for office, she also was on the board of the Discovery Institute, which gets evangelical funding to undermine secular "materialist" science education and replace it with a sophisticated version of creationism called Intelligent Design. They claim ID is science, but even the Templeton Foundation, an organization that funds the intersection between faith and science disagrees and won’t give them money. I find it dismaying that Hutchison has been around the caliber of scientists she claims to have encountered through her work at Simonyi without developing a deeper understanding of the scientific method and why it works so well. Hutchison spoke this month at a conservative think tank, the Washington Policy Institute that espouses free market fundamentalism and right now is promoting a film trying to deny climate science and dissuade climate action. So again you see this inclination toward undermining the scientific enterprise — in the WPI case with an eye toward economic policy. In my mind the connection between free market fundamentalism and Christian fundamentalism is an orientation toward ideology (ie. strong narrative filters that screen out contradictory information) and perhaps consequently a weakened ability to run a recalculation on early assumptions and decisions. I look at Susan Hutchison, and as a former evangelical I see a woman on a mission, in that sense much like Sarah Palin, but without the weird exorcism of witches stuff. Hutchison’s evangelical associations have steered her in a very specific political direction: She gave money to evangelical Republican Mike Huckabee over John McCain. She refuses to answer questions about reproductive rights. Heck, she even refuses to tell people that she’s a Republican. While working for Charles Simonyi and giving away his money, she has had plenty of opportunity to become more sophisticated about the scientific method and data based decisions — but instead I worry that she has become better at clinging to an ideology in the face of evidence to the contrary. I personally prefer having someone in the King County Exec office who bases their policy decisions on data and who is on a mission to serve the people of King County.